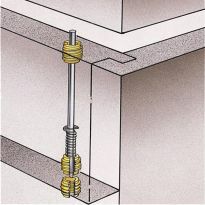 Uniquely designed strike plate allows for easy mounting when door and frame are of the same thickness. Tried all the local hardware stores in my area including the big ones. No one carries such a thing and I use these frequently in repairing old antique furniture where nothing else works. Top quality product but, for my specific application, difficult to install on a large kitchen cabinet drawer . . . alignment was my challenge. W/O the extreme help from Sherry & her knowledge, this installation would be a lesson in futility. Works well on one drawer however. another drawer requires more wood trim elevation which needs 1/4â?? longer magnet mounting screws. I took the lock out and just put this magnet in its place. It holds the door tight on my wife's curio cabinet. It was an easy fix. 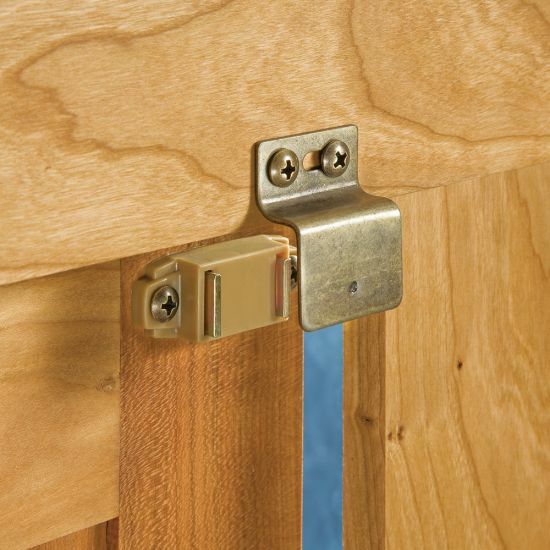 Magnetic catches seem to always be a problem to use on face frame style cabinets or furniture with inset doors without adding blocking or some other secondary structure. This offset bracket eliminates all of that -- it provides an easy, clean way to install magnetic catches. I wish I would have noticed these years ago! These unit did the job for holding doors in a bathroom vanity that I made for my daughter. Needed a catch for the doors on an entertainment cabinet. The doors are recessed 1/4" from the face frame. These catches allowed for the offset perfectly. Used on the door for my new Jazzuci tub. Works great. These are easy to install and work very well. A durable product. Was simple to install in a difficult place, and works perfectly. 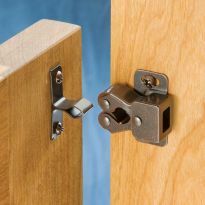 Excellent design with strong magnet.I used them on flush doors and found them easy to install and worked very well. Used on a built in hutch with flush mount doors. I purchased the partial wrap non-mortised hinges. They look beautiful. One tip; if you are going to use the catches at the top of the cabinet, it is better to install them before you put on the face frame. Perfect design for flush doors. I needed this for the sink base cabinet unit. Plenty of hold. They work as they should. I kept one star for myself to offset the price. They don't need to be that expensive. Solved my latch problem perfectly! Nothing fancy. Does the job. Simple installation and a nice solid hold. My only quibble is a price point that seems a little high for what it is. Exactly as stated on the web site. Strong magnet and will suit my purpose perfectly. Good value given the free shipping offer at the time of my purchase. Likely would not have purchased online if I had to pay shipping...would have shopped locally. Easier to use these catches for inset doors than adding material to the inside of the cabinet to accommodate standard catches. Only catches I could find anywhere for inset doors in face frame cabinets. To hold a door closed. 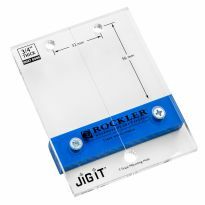 It's was the right application and I've ordered from Rockler before. 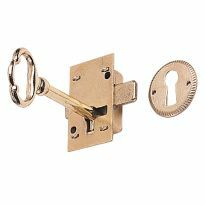 I've used them in the past and they work perfectly for inset-doors. For a curio cabinet I built for my son. Have used magnetic catches before, but like the offset metal bracket for a flush drawer front. My cabinet doors are missing this part. for cabinetry work. easy to install. Affective. It looked like a very easy installation for inset doors. The item fit the specifications for a current project. Very easy to install and adjust. For use on an antique door we didn't want to tear up to put a new knob/latch in. 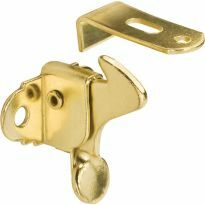 Can this replace kitchen cabinet knob latches? 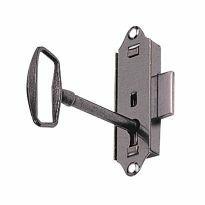 If so, do you use regular knobs on the doors, with this catch on the inside? BEST ANSWER: I think if the magnet is lined up with the door, it should keep the cabinet door in place. If it is a long or tall cabinet door, I suggest to use two magnets, one higher than the other, especially if the cabinet doors are wood, which tend to change from their original dimensions because of the heat and cooling over the seasons. ANY handle or knob you like will work. Catch is all mounted on the cabinets inside face and frame.